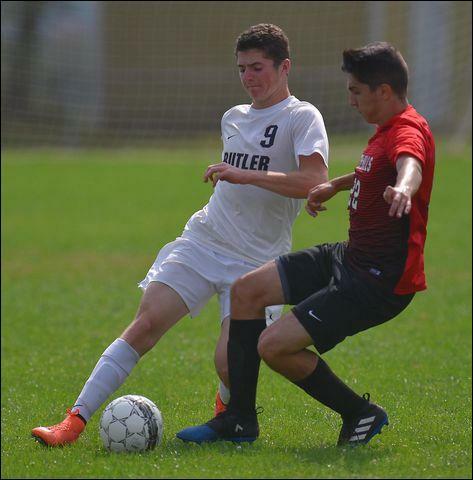 Butler senior Justin Stewart (9), competing in soccer. BUTLER TWP — When it comes to sports, Justin Stewart never stops. The Butler High School senior plays midfield for the Golden Tornado soccer team during the fall, wrestles at Butler during the winter and plays catcher for the Tornado baseball team in the spring. He also catches for his summer baseball travel team. And he's been doing them all for a long time. Stewart has been playing soccer since he was 4. He's been playing baseball since age 5 and has been a wrestler since he was 7. He has already signed a letter of intent with California (Pa.) University to play baseball next year. Stewart was 13-18 as a junior on the mats for the Golden Tornado last season and entered this year with an 18-25 career record. The idea of leaving the sport wasn't on his radar. “It never even crossed my mind,” Stewart said. He's off to a 9-2 start this year and “has improved remarkably,” Stoner said. Whatever the season, Justin Stewart is into that season. He scored 15 goals in soccer last fall in helping Butler reach the WPIAL playoffs. He is one of six Tornado baseball players who have signed on to play college ball next year. 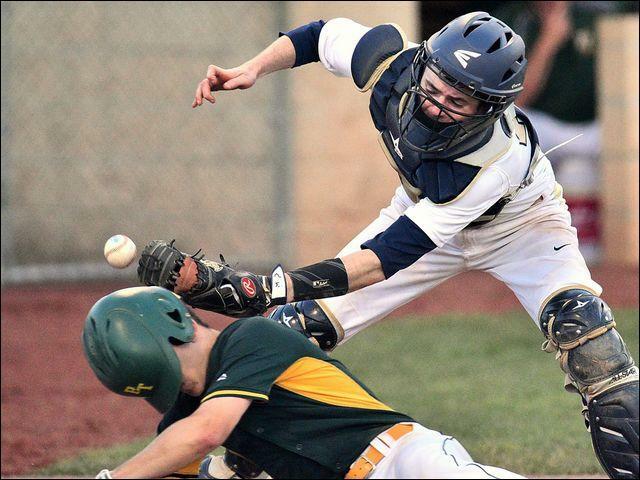 “It's hard getting a kid to play two sports in a school year these days, let alone three,” Butler athletic director Bill Mylan said. “You see multiple sport athletes ay smaller high schools because they're needed to sustain a lot of those programs. Butler baseball coach Cody Herald said he encourages his players to participate in other sports in high school. He played baseball and basketball during his prep years at Butler. Butler senior Justin Stewart as a catcher in baseball, is a rare three-sport athlete these days for the Golden Tornado. He is competing in wrestling this winter. “I know a lot of coaches want their athletes to concentrate on one sport alone these days,” Herald said. “But, to me, that's the way it is in college. Herald said he's impressed that Stewart competes in so many sports that require leg strength. “He uses the lower body quite a bit,” Herald said. “In soccer, you're always running. There's the leg drive in wrestling and they say the first thing to go on a catcher is his knees. But Justin is in tremendous shape. Stewart enjoys the common denominator of his three sports. Stewart's father, Craig Stewart, was a catcher at Clarion University. Stewart added that he never entertained the idea of dropping any of the three sports through the years. “I never wanted to experience that void,” he said. “One sport, one season, leads into the next. That's how I've led my life.